Megaphone marketing is shouting at many with the hopes of attracting a few. Megaphone marketing tactics just don't work the way it is usually expected to work. Examples of megaphone tactics include untargeted mass media print advertising, yellow page advertising, directory advertising, untargeted banner advertising, cold calls and mass email blasts. In the recent times there had been a fundamental shift in customer behavior. Customers don't want to be interrupted and megaphone marketing is an interruption. Customers want to be in control of the information they receive. The solution is Magnet marketing. This puts the customer in control. Magnet marketing helps you get found by customers at the very moment they have a need for your products and services. It allows you to earn trust by providing customers with information they value to attract them to your website to do business. Examples of magnet marketing tactics include content marketing, search engine optimization, pay-per-click advertising and various social media marketing. 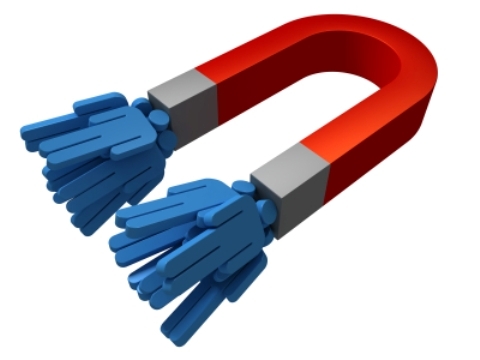 Magnet marketing tactics generate more leads and sales and they are less expensive. It also offer you a tremendous opportunity to engage directly with customers. However, to get in front of them in the first place, you need great content. It is worth spending the time in creating great content. On the internet you are what you publish. If you publish great content on the internet, you are great. If you publish bad content on the internet, you are bad and if you do not publish anything on the internet, you are nothing. People don't choose to do business with you just because you offer the right products at the right price. They choose you because you and your team have valuable, specialized knowledge about the applications of your products. Lead with that specialized knowledge in your marketing by writing best practice articles, 'how to' videos, an insightful blog and creating educational guides and whitepapers. By marketing your knowledge instead of just marketing your products, you will be considered not only the provider of the product but also a provider of expertise in that particular area, that makes you unique in your chosen market. Is your agency pushing you to buy ads? Can you spend your entire life living out of a hotel room? Copyright Khalid Abdullah Khan. Simple theme. Powered by Blogger.